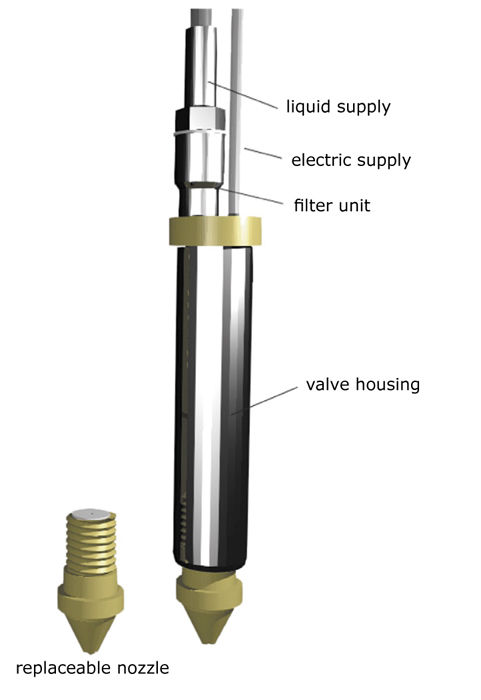 Nanojet Dispenser Heads feature a miniaturized solenoid valve and a glass capillary nozzle through which the liquid is emitted. The liquid is transported from the reservoir to the dosing head by means of gas pressure. The special nozzle shape provides laminar liquid flow, which prevents liquid from atomizing, thus ensuring that liquid is restricted to the target area. The possible nozzle diameters range from 50 μm up to 500 μm. The dispenser volume depends on gas pressure, solenoid valve opening time, nozzle diameter and liquid viscosity. Electronic control of the valve in combination with the pressure control ensures a precisely dispensed volume. Here the work pressure is adjusted between 500 and 3500 hPa with a variation of 1 %. The valve opening time can either be set between 3 ms to 2 s or via trigger input. A serial port is optional available. For functional testing a toggle switch allows the manual opening of the valve. The small dimensions of the heads are particularly advantageous for integration in existing systems.